Find My Workspace lists over 95% of the executive office suites market in Doral. Simply click Request Quote to check pricing for one office, or Add to Basket for multiple offices. OPENING JANUARY 2019 – This center is a modern workspace community that is inspiring, diverse, and collaborative. It’s more than just shared office space, it’s a place where individuals and businesses launch, expand, and achieve success. A space designed for the broadest mix of professional office workers, not just for tech companies, freelancers or startups, we designed it to also attract small businesses as well as large fortune 500 companies. This space has been recognized by Inc. as one of the best co-working spaces in the nation.This center is a perfect mix of modern appeal for those looking to have a new way of working. Doral, Florida - NW 89th Ct. 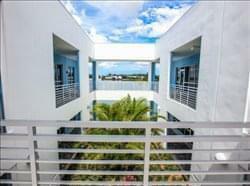 This modern, contemporary two-storey waterfront building is located in the heart of Doral. Here, you will be supported by a friendly on-site management team who can assist with any queries you may have. You can also make use of the spacious on-site meeting rooms and conference rooms, as well as copying & printing facilities and reception services. The center offers good transport links as well as an on-site car park to use during working hours. The range of technologically sophisticated facilities and professional services on offer make this location the ideal working environment for any type of corporate requirement.